Well, it’s most of the way here. It’s in the basement of our apartment building, along with the rest of the kitchens for the Varnero faranji. They have actually been there for more than a week. It seems that now they’ve got this far, our landlord has lost interest in installing them. Maybe that’s because he is focusing his attention on the plumbing problems that several of our neighbors are suffering from. That’s OK. Our kitchen never got repainted after the espresso debacle, and that needs to be done first. 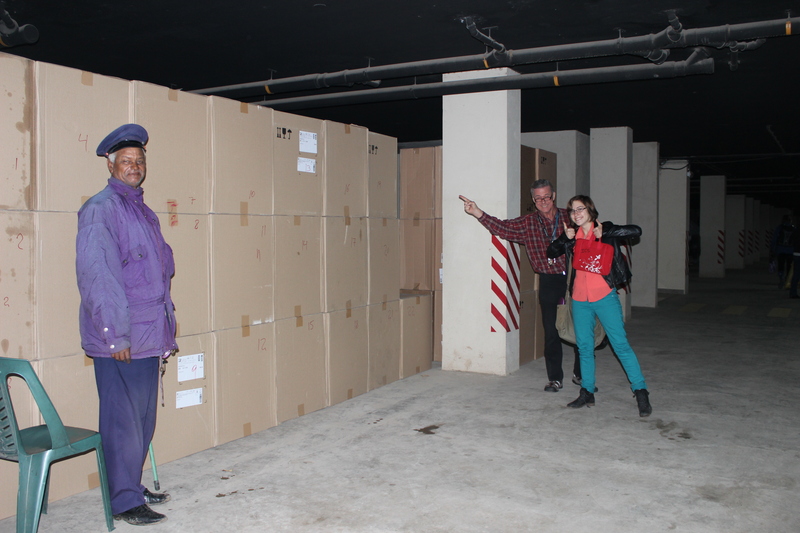 Alekka and our neighbor Jerry when we discovered the cartons in the basement. The guard is making sure our kitchens don’t take any more unscheduled trips.